That there was a time when the "County of Bruce" was an unknown designation is a statement to be readily admitted. To fix the date when as a corporate municipality it came into existence and first bore its present title is what this chapter will endeavor to set forth, as well as to narrate the beginnings of its municipal life. The facts so far presented to the reader have largely anteceded the existence of the municipality of and even the name of the county of Bruce, which was bestowed, as we shall see, some time after the inflow of settlers had well set in. Prior to this, as related in a previous chapter, the appellation of the "Queen's Bush" was commonly applied to the unsettled lands lying north of the Huron District, the larger portion of which ultimately comprised the county of Bruce. This same territory is described more formally in an Act of Parliament [9 Vic, Chap. 47, passed May 23rd, 1846.] that provides for the administration of justice therein as, "That portion of the province lying to the northward of the District of Huron, bounded on the north by Lake Huron and the Georgian Bay, which is not included in either of the Districts of Wellington or Simcoe, (which) is declared, for all purposes of and connected with the administration of justice, civil and criminal, to form part of the District of Huron." An effort was early made (the particulars of which are given in a foot-note) to have this territory formed into a county with Owen Sound as the county town, the agitation for which, however, proved abortive. [Footnote: Copy of notice appearing in The Canada Gazette, August 26th, 1848: "Notice is hereby given, that application will be made to the Legislature, at the next sitting of Provincial Parliament, by the inhabitants of the townships of St. Vincent, Euphrasia, Collingwood, Osprey and Artemesia, in the Simcoe District, and of the townships of Sydenham, Derby, Holland, Sullivan, Glenelg, Bentinck, Normanby, Egremont, Proton and Melancthon, in the Wellington District, for an Act to be passed to form these townships into a county; including the unsurveyed lands west of the said townships and extending to Lake Huron and the Indian Territory and Islands contiguous thereto, and that the town of Sydenham, on the Owen Sound, be the county town of said county." James Bruce, Earl of Elgin and Kincardine, was Governor-General of Canada at the time the "Queen's Bush" was surveyed. It was out of compliment to him that his family name was bestowed upon the new county, which was brought into existence by authority of an Act of Parliament, [12 Vic., Chap. 96.] passed May 30th, 1849, dividing the district of Huron into three counties, Huron, Perth and Bruce. This Act defines the boundaries of each of the new counties, and goes on to say: "The counties remaining nevertheless united until the union be dissolved, so soon as it shall appear by the census that any junior county contains a population of fifteen thousand, on order of the Governor-in-Council and upon petition of two-thirds of the Reeves." The County Division Substitution Act, passed at the same session of Parliament, to abolish the old territorial district divisions within the province, [Prior to this and kindred Acta coming into force, the districts within the province, comprised the limits of the respective shrievalties within which Courts of Assize, etc., were held, each district, subsequent to January 1st, 1842, being a corporate muncipality. The counties comprised the political divisions for parliamentary representation, and the limits wherein registration of titles to property were made, there being a registrar for each county.] names the townships that were to comprise the county of Bruce as follows: The townships of Arran, Brant, Bruce, Carrick, Culross, Elderslie, Greenock, Huron, Kincardine, Kinloss and Saugeen. While "All the peninsular tract of land, lying to the north-ward of the townships of Derby, Arran and Saugeen and between Lake Huron and the Georgian Bay and known as the Indian Reserve, shall be annexed to, and form part of, the county of Waterloo." [The county of Waterloo in 1849 comprised the same territory, and was conterminate with the District of Wellington, extending from the Georgian Bay, in the north, to the township of Wilmot as its southerly limit. The Saugeen Peninsula became a part of the county of Bruce by 14 and 15 Vic, Chap. 5, passed August 2nd, 1851.] These two last-mentioned Acts of Parliament came into force on the 1st January, 1850, which date is, therefore, the birthday of the county of Bruce, for under the terms of these Acts of Parliament it on that day became a municipality, although only the junior one of the united counties of Huron, Perth and Bruce. With the abolishing of district divisions within the province, and contemporaneous with the advent of Bruce among the municipalities thereof, came also a change in the mode of municipal government. The earliest form of local government that existed in Upper Canada was that administered by the Quarter Sessions, held in the several district towns, the members of which were the justices of the peace within the district. This body possessed, besides judicial powers, administrative, and to some extent legislative functions. This system of local government continued in force until 1842, when district municipal councils were established, [The first meeting of the Huron District Council, it being the council that had charge of the territory afterwards comprised in the county of Bruce, then but the "Queen's Bush," was held February 8th, 1842. The first warden was Dr. William Dunlop, M.P.P., and Daniel Lizars, the first municipal clerk for the district.] the members of which represented the several townships in the district and were elected by the ratepayers. The district council performed the work now undertaken by county, township and village councils, levying taxes for local improvements and school purposes. Annual township meetings were held, at which the freeholders and householders elected the following officers: a clerk-treasurer, assessor, collector, overseer of highways and pound-keeper. These officials, before the passing of the District Councils Act, acted under the direction of the Quarter Sessions. There were also two township wardens; these acted "as a Corporation to represent the whole inhabitants of the township" in any action at law, but had no legislative powers or functions. The change indicated in the mode of municipal government, spoken of in a preceding paragraph, affected the county of Bruce when on Monday, January 28th, 1850, the first session of the Council of the united counties of Huron, Perth and Bruce was held at Goderich, when Dr. Wm. Chalk, the Reeve of Tuckersmith, was elected warden, and Alfred W. Otter appointed county clerk. Among the members of the Council then and there assembled was Thomas Johnson, who sat as reeve for the municipality of the "United townships of Ashfield and Wawanosh, in the county of Huron, and all the townships in the county of Bruce," [This enormous stretch of country, so formed into one municipality, had its Township Council composed, in 1850, of Thomas Johnston, reeve, and Councillors John Hawkins, William Graham, Jeremiah Flynn and John King. The clerk and treasurer was Michael Healy. In 1851 Charles Girvin was reeve, and John Strachan, clerk-treasurer. Not one of those here mentioned was a resident of the county of Bruce. The author has been told that the settlers in Bruce sent Allan Cameron to this meeting of the Council as their representative, this being unauthorized by either statute or by-law. His claims as a representative were not recognized.] which municipal union had been brought about by a by-law of the Huron District Council, passed at a special meeting held October 2nd, 1849, called to make the necessary preparatory arrangements for the new order of municipal government required by the Acts of Parliament just passed. The idea of forming a municipality by a union of townships in two different counties was a blunder, productive of trouble that was not smoothed out until a couple of years had passed. It is not difficult to surmise why the District Council formed the union of townships indicated in the foregoing lengthy title. The Municipal Corporation Act of 1849  provided that townships having less than one hundred resident freeholders or householders were to be attached to some adjacent township in the same county. As the required number were not to be found in the whole of the county of Bruce, the District Council thought that it was acting within the limits of its authority in attaching the whole county of Bruce to the two adjacent townships of Ashfield and Wawanosh. The settlers in Bruce thought otherwise, and after obtaining legal advice they repudiated the by-law forming them into a municipality conjunctly with the townships of Ashfield and Wawanosh, and refused to pay taxes either to the township or the county. This position was maintained until the separation from the two townships in Huron was effected, after a nominal union which had lasted for the years 1850 and 1851. The attitude of the settlers in Bruce in refusing to pay taxes was sustained, and it was not till 1852 that taxes for township purposes were first collected in the county of Bruce, and 1853, when the first levy for county rates was paid. 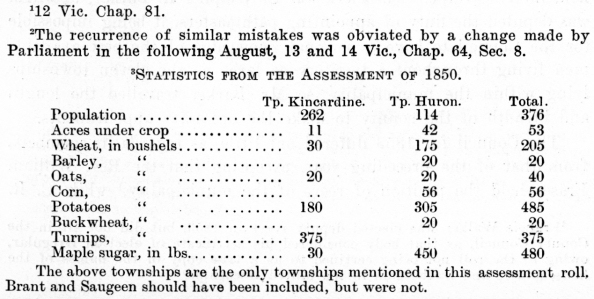 An assessment of the county was attempted in 1850, but only Kincardine and Huron Townships were included therein; Brant, where, as we have seen in a preceding chapter, a small settlement was commenced in 1849, was not assessed. The statistics  obtained by this assessment are most interesting, revealing the actual progress made by the settlers during their first year in the bush, and are given in a foot-note. Although, owing to the above mentioned blunder of the Huron District Council, an enforced collection of taxes could not be legally made in the townships within the county of Bruce, the settlers were not content to escape the burden of taxation, the penalty being loss of municipal rights and privileges. A petition was therefore presented to the Council of the United Counties in December, 1850, asking that the townships in Bruce be separated from Ashfield and Wawanosh and formed into a separate municipality. This the council declined to do that year, owing to legal technicalities. The petition was, however, complied with in 1851. At the first session of the united counties council in 1852 there was present Francis Walker, who sought to sit as reeve for the township of Kincardine and the remaining townships within the county of Bruce. He was not, however, permitted to take his seat, owing to some irregularity which had occurred regarding his election, the nature of which the author has not been able to trace, beyond that a protest as to his right to hold the office was entered. That the vacancy might be filled, the Council directed the warden to issue a warrant for a fresh election at Kincardine, and "that Mr. Francis Walker be returning officer." The result of this election was that William Rastall was elected reeve. To him belongs the honor of being the first representative from Bruce to sit at the County Council. The date when he took his seat as such was May 3rd, 1852. The municipality of which Mr. Rastall was the head comprised all the townships in the county of Bruce, Kincardine being the senior township. This municipal union lasted during the years 1852-3. The Council thereof for the year 1852 consisted of Wm. Rastall, reeve, and councillors, Rev. Wm. Fraser, Francis Walker, Wm. Blair and Thos. Harris. The meetings of Council were always held in Kincardine. The clerk was Christopher R. Barker, to whom was deputed the duty of appointing pathmasters, it being impossible for the Council to have a personal knowledge of the best available men living throughout a territory as large as the eleven townships lying within the municipality, so Mr. Barker travelled the length and breadth of the county to make the necessary appointments. The Council for 1853 differed but little, as regards its members, from that of the preceding year, excepting that the Rev. William Fraser held the position of reeve of the municipality, [Francis Walker was elected deputy reeve in 1853, but did not sit in the County Council, as that body considered his certificate of election irregular, owing to the roll not being certified to as a true copy of the names of the householders and freeholders in the united townships.] while C. B. Barker remained as the clerk-treasurer. In a footnote1 are to be found the names of the assessors and collectors for the years 1852-3 and of the taxes collected in the latter year. Without exception the members of the Council of "The United Townships in the County of Bruce," as given in the preceding paragraph, resided in either Kincardine or Huron Townships. The councillors being all from one section of the county, it is easy to perceive how the actions of the Council might be biased by local interests. The incident about to be related proved that in some instances, at least, this was the case. Those who settled at Kincardine and in the immediate vicinity were from the first strongly impressed with the desirability of having a harbor constructed at that point (in accordance with the plan suggested in the original survey of the town-plot), which would permit vessels to load or unload safely in any weather. This sentiment was, of course, from local interests, one in which the individual members of the Townships Council participated. 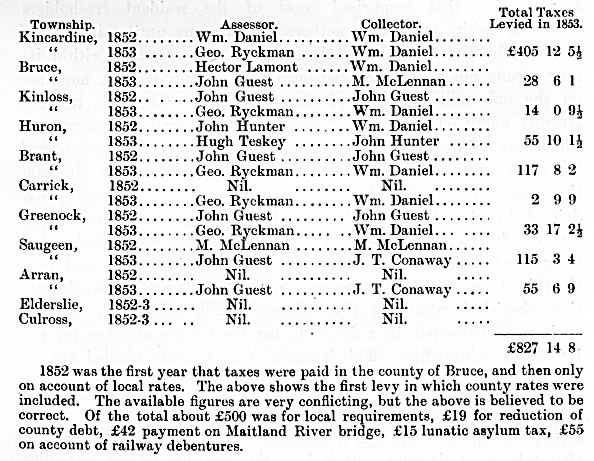 Names of the Assessors and Collectors of the United Townships for the Years 1852 and 1853, and of the Levy for Taxes for the Latter Year. The proposed Kincardine harbor by-law was to be considered and voted upon by the ratepayers on May 28th, 1853, at the village of Penetangore (Kincardine). [See procedure of such a meeting, given in 16 Vie., Chap 22, Sec. 5 and 6.] A great rally was organized in the outside townships to vote the project down. The voters from the north reached Kincardine by sailing vessels, Capt. D. Rowan, in command of the Emily, and Capt. John Spence, in the schooner Sea Gull, bringing large contingents. Prom Brant there started a procession that comprised most of the resident freeholders of the township, and which gathered in numbers until Kinloss was reached; by that time it numbered fully four hundred within its long strung out ranks. At the head rode Joseph Walker, mounted on the one solitary horse of the settlement. The rest trudged sturdily along on foot, one of their number carrying a banner, on which was painted the motto, "Brant, No Taxation, No Surrender," the lettering of which was the handiwork of Mr. Malcolm McLean, the present postmaster of Walkerton. At Johnston's Corners Mr. John Eckford and others addressed the gathering, and united action was decided upon, one item of which was to the effect that not a penny was to be spent for food or drink in Kincardine, and thus show in a marked manner, as well as by their votes, the sentiments they cherished regarding this scheme, which originated, so they vociferously asserted, in a desire to tax the county at large for the benefit of Kincardine. This proposal was actually carried out by many, who brought with them food and whiskey sufficient to last during their stay, and who also, when night came, slept under the juniper bushes on the lake shore rather than ask for shelter in some house in the village. The preliminary meeting, as well as the voting, was held at "Paddy" Walker's tavern. During the proceedings the Roll of Brant was surreptitiously purloined and buried in the sand near the beach. Any action after the disappearance of this Roll would have been irregular, so Messrs. Wm. Gunn, Valentine, Conaway, Benson and Hilker served a protest, and demanded that all proceedings in regard to the by-law be stopped, which, under the circumstances, had to be complied with. The excitement, which all day had been at fever heat, was much augmented by stirring speeches and an abundant supply of whiskey. In such an atmosphere fights started very easily. These at last became so general that it seemed at one time as if the many fights would merge into a general riot. To prevent this Reeve Fraser had some twenty-two special constables sworn in, who succeeded in maintaining the peace and in dispersing the excited throng to their homes. Thus Kincardine's first effort to secure the construction of a harbor collapsed; nevertheless, there remained implanted in the breasts of many throughout the county a resentful feeling against that village, cherished for years afterward. United townships of Kincardine, Bruce and Kinloss......William Rastall, Reeve. United townships of Arran and Elderslie......Richard Berford, Reeve. The dissolving of the union of all the townships in the county and forming thereof six municipalities was a measure much appreciated by the ratepayers. A large increase in the number of settlers was required, however, ere each township could enter upon a separate career as an independent municipality. The first to do so was Kinloss, which in 1855 was detached from Kincardine and Bruce. The following year (1856) witnessed the severance of the union of Kincardine and Bruce Townships, of Brant and Carrick, of Greenock and Culross, as well as of Arran and Elderslie. It was in this last mentioned year that for the first time each of the several townships comprised in the original county of Bruce sent a representative to attend the Council of the united counties of Huron and Bruce, there being but these two counties in the union at that time, Perth having separated therefrom on January 1st, 1853. In doing so Perth assumed two-fifths of the liabilities of the originally united counties. Among the many municipal alterations which occurred during these changeful years, the uniting of the township of Amabel to that of Arran should not be overlooked. This union was accomplished December 18th, 1856, when the United Counties Council passed a by-law to that effect. Amabel was the first of the newly surveyed townships in the Indian Peninsula to come into possession of municipal privileges and responsibilities. By this time the population of Bruce had so increased as to warrant an application being made to have abrogated the union of the counties of Huron and Bruce. This was acceded to and Parliament passed an Act on May 16th, 1856, [19 Vic, Chap 19.] authorizing the formation of the provisional County Council of Bruce, the preliminary step towards a separation from Huron. At this time it was hoped that a few months would see the separation completed, but local jealousies as to where the county town was to be, intervened to prevent a consummation so desirable. The story of the ten years' struggle for the county-town is reserved for another chapter. The tabulated statement of the equalized assessment of the several municipalities within the county, as given in Appendix M, indicates the growth, as well as the relative development, of each township during the days when Bruce was but an "infant county."